Our classmates from the 1979 Batch of Sainik School Amaravathinagar, Tamil Nadu, along with their family, were invited by Vice Admiral Ashok Kumar, AVSM, VSM, Commandant National Defence Academy (NDA) for a get together at the NDA. On 23 December 2015, during breakfast at the Army Training Area of the NDA, our classmate, Veteran Colonel AC Cherian from 16 Punjab briefed everyone about the army tactical training being imparted to the cadets. The civilian classmates and their ladies, primed with the briefing on army training, wanted a brief on the Kargil War of 1999. They appeared to associate the army training with the Kargil War as it was beamed live into their drawing rooms. They seemed mesmerised by the “Dil Maange More” (The Heart Wants More) war-cry by Param Vir Chakra recipient, Captain Vikram Batra during the war. Cherian immediately pushed me forward and said “Reji will brief you on Kargil War”. Collecting my wits after the surprise task thrown at me, I begun by saying that I was serving at the Army Headquarters during the war and my brief talk would be based on the information I gained during interactions with the officers who participated in the war, various presentations I attended and my reading on the subject. I also said that the only association I had with the Kargil War was that I served under Veteran Lieutenant General Mohinder Puri, PVSM, UYSM, architect of Kargil War Victory, when he moved in as our boss at Army Headquarters after the war. Everyone listened attentively to my talk of about 15 minutes and at the end there were many interesting questions raised, especially by the teenagers present. It proved a point that the nation still values the heroism, valour, bravery and sacrifices of our soldiers during the Kargil War. On return to Canada after three weeks, I sat down to write my experiences during the event for my blog. 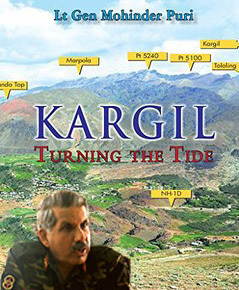 While researching about NDA, I chanced to hit upon a link to the book “Kargil – Turning the Tide” by General Puri. I immediately downloaded it and read the 200 page book. The book is a first-hand account of the war by the General who commanded 8 Infantry Division in the war. It follows a logical pattern and discusses historical events – from the genesis of Kashmir imbroglio – leading up to the Kargil War of 1999. The book also covers in detail the hitherto unknown facet of Kargil War: the withdrawal of the enemy and restoration of the sanctity of the Line of Control (LC) upon declaration of cease fire. The terrain analysis of the region and how it affected the conduct of the operations has been narrated in a simple and easy to understand form. I recommend the readers to familiarise with the terrain analysis prior to reading the chapters on conduct of the battle. Similarly, while reading the accounts of various operations during the war, I recommend the readers to study the map of the operations and make a mental picture and correlate it with their reading. In case you are reading it on your computer or PDA, I would recommend you to open another window with the map and correlate as you read. Adding a chapter with explanations of various military symbols used on the maps would have surely helped better assimilation. The book, more than being an authoritative account on the Kargil War from a military history and military doctrine point of view, I saw it more as a book on leadership. Of the many Generals under whom I served in the Indian Army, General Mohinder Puri is clearly one of the few whom I have admired as a leader and a thoroughbred professional. Over the years this respect and admiration have grown into a genuine fondness. I recommend this book as a must read for all officers and cadets of our armed forces. General Puri, as I know him, is a very humane and compassionate General who would always give a lot of leeway to his subordinates. I have always seen him with a smiling face and a pleasant attitude. In the book he has brought out an instance when he did lose his cool. I wondered as to how he would have looked in that frame of mind and in spite of my best efforts, failed to juxtapose an expression of anger on the image of his face. After he lost his cool, the General realised that he needed to see the problem from his subordinate’s point of view and apologised to him. He later reiterates that commanders at all levels have to have the conviction to stand up for their point of view, especially when it comes to the safety and well-being of their troops. General Puri could easily assess the strengths and weaknesses of each of his subordinates and task them such that they would deliver optimum results. Various anecdotes during the battles clearly bring this out. He is forceful where required, but has a keen ear for the inputs and suggestions of his subordinates before he takes a critical decision. It is generally believed that a democratic leadership style in a military leader is not ideal, particularly in combat situations and at times may even be disastrous. Gen Mohinder Puri is perhaps an exception in this regard. The General brings out a lesson that every leader has to take counsel of one’s fears and proceed with the task with a positive frame of mind. He further states that a military leader must be sensitive to casualties and must be prepared for it and that there should be no undue haste in progressing any operations. The General throughout the book gives credit where due to all his subordinates, his superior officers and also to his wife Prita and daughter Ayesha. It brings out a lesson that it is imperative for a good leader to give credit to all those who helped him achieve glory. Further, the coverage of the operations of his neighbouring formation, 3 Infantry Division, in the book cements this trait of the General. His respect for humanity and also for the enemy who inflicted heavy casualties on his soldiers is evident in the book. He describes the dead Pakistani soldiers of the Northern Light Infantry (NLI) whom his Division buried as gallant men who laid down their lives for their motherland. He further comments about Capt Kamal Sher, a Pakistani officer killed during the war as a soldier who fought most gallantly and was appropriately given the highest gallantry award by his country. He does not fail to give credit to the enemy for their skill in camouflage and concealment and their exceptional fire-control. The book covers in great detail the planning and conduct of tactical battles with a micro perspective. The accounts of the operations for the capture of Tololing and Tiger Hill (which became household names, thanks to the media) and many other such battles, told the story of human endeavour, perseverance, grit and determination. The General describes the anatomy of a herculean challenge, the nuances of close quarter, hand to hand battles fought in challenging and hostile environment of extreme rugged high altitude terrain, inclement weather and an entrenched enemy. The narrative gives an idea of the values associated with the honour of one’s ‘paltan’ (battalion), the army and the nation and what it means to fight for these values. It covered the emotions of soldiers who were stepping into an arduous task knowing very well that there may be no return. It tells the story of fortitude, of agony and ecstasy, of raw courage and exemplary leadership, particularly at junior levels. From a macro perspective, General Puri describes in great detail, constraints of undertaking the task of evicting the enemy from our positions, while sticking to the political directive of not crossing LC. It was strategic constraint which severely affected tactical operations. As the gaps in defenses were tactically impenetrable, the only remaining option was invariably frontal assaults leading to much increased level of casualties. One wonders if this political directive was sound and sensible. If our political leadership/bureaucracy had had some experience in matters military, possibly such a directive would not have been issued to the military. Did the decision makers fully understand the consequences? Had the Ministry of Defence (MoD) been adequately staffed with defense experts, would there have been a difference? Was this decision under international pressure? What purpose did it serve? Was it simply fear of escalation? Falling prey to nuclear bluff? These are indeed unanswered questions. The General however makes it amply clear that while the decision did gain some strategic brownie points, it did severely affect planning of operations and resulted in greater casualties. The book also brings out the need of the Indian Air Force to reorient their training to operate in high-altitude areas, especially keeping in mind the need for such limited scale operations. One hopes that the Indian Air force has learnt the lessons from the Kargil War. The General has taken a lot of effort to bring out the role played by the Arms and Services of his Division. Since the operations in Kargil were Infantry predominant, the book has a separate chapter on Infantry Operations, which immediately precedes the chapter on Supporting Arms and Services. The role played by the Engineers, Signals, Army Service Corps, Army Medical Corps, Ordnance and Aviation has been given due recognition and credit in achieving the victory. As a Gunner Officer, I am very much impressed and also envious about the methodology used by the General in employment of Artillery, especially using the Bofors Gun in direct firing mode. I suggest that the General’s account of Artillery in the book be appended to the book on Tactical Handling of Artillery, issued to all officers at the School of Artillery. The role played by the Media, especially Ms Barkha Dutt, in bringing the battle into the living rooms across the globe has been acknowledged in the book. The media coverage ensured that the countrymen were aware of the battles of Tololing and Tiger Hill. It also ensured that the fallen soldiers were duly honoured when their mortal remains reached their villages. The book also emphasises the need for better synergy between the armed forces and the media and the need for an institutionalised interaction between the two, both during war and peace. I sign off with an anecdote. One day Marina wanted to go for a movie with the children and hence planned to drop me off at the office and take the car. She drove me to the foyer of our office building and stopped and at that moment I saw General Puri’s car stopping behind ours. I jumped out of the car and signaled Marina to drive off and I waited with a sheepish face. General Puri alighted from the car and with his ever smiling face said “Lucky Man – Lady Chauffeur Driven” and walked off. Very well written. The general was my GOC as I served in 8 Div as an OC Wksp and got posted out before the war . I again came across him when I was commanding my bn when he was the corps cdr. Great narration Sir. Excerpts from this book could be included in history lesson book in schools for the next gen to know the scrifices. Greatly appreciate your perceptive write up, which captures the General’s personality very accurately. Since the operations in Kargil were Infantry predominant, the book has a separate chapter on Infantry Operations, which immediately precedes the chapter on Supporting Arms and Services. Gen Puri is one of the most soft spoken general. He must have made a great GOC in Kargil. But sorry, Kargil was not Indo-PAk War, it was battle involving four (3) Indian divisions. It was a very brave effort of our YOs who led from front to give credit to Army.